Whyteleafe seem to save their best performances for when they play the top sides and tonight was no exception, with a fine victory over 2nd placed Hastings that sees them climb to 5th place, back into a play off spot. An entertaining match with plenty of attacking football from both sides. The first chance fell to Leafe in the 6th minute when Bradley Wilson made a fine run and cross, picking out Lauris Chin in the box, but he couldn't strike the ball as well as he would have liked and the ball went wide. Antonio Walker-Barth had Hastings' first chance in the 12th minute but shot wide of the far post. Marvin Armstrong was in a good position in the 20th minute when he was about to shoot from the edge of the box. A defender managed to toe poke the ball just past his own post. The games decisive moment came in the 26th minute. Wilson chased a long ball and was first to reach it, but just outside the box, Tom Climpson brought him down from behind and was shown a straight red card. Wilson got up to take the free kick himself and struck it well beating the wall and the diving Charlie Horlock to find the back of the net. Chin had a chance to extend the lead in the 36th minute when he beat 2 defenders in the box but his shot was deflected wide. Leafe started the second half well and Wilson should have added a second in the 48th minute when Harrison Carnegie picked him out in the box but he shot wide when well placed. Nathan Campbell was cautioned for a foul 25 yards out in the 56th minute but Sam Cruttwell blasted the free kick over the bar. Another fine run from Wilson in the 70th minute saw his cross find Carnegie but his shot went into the side netting. Wilson was in the thick of the action, and his well directed corner in the 77th minute found Bryan Akongo in the box, and his header found the back of the net to extend Leafe's lead. 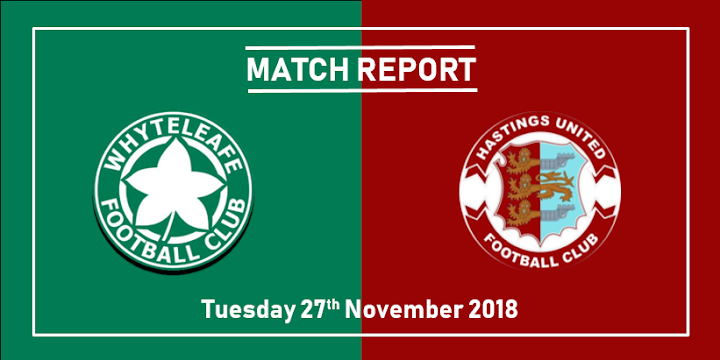 Hastings threw men forward in an attempt to get back into the game, but the Leafe defence, with the second best defensive record in the league, held firm. In fact it was Leafe who nearly extended their lead twice in the closing minutes, when firstly Scott Day broke clear, but shot straight at the advancing Horlock, then Chin also broke clear, his shot hit the inside of the post, rolled along the goal line and spun off beyond the other post for a goal kick. A welcome 3 points for Leafe after taking just 1 from the previous 3 matches. Whyteleafe Team; McCarthy, Wilson, O'Donoghue, Campbell, Thompson, Holder, Akongo, Graham, Chin (Attabi 84), Armstrong (McGeoghegan 87), Carnegie (Day 78). Subs not used Offei Akoto.